At Miller’s Casework, our motto is, “Old world craftsmanship meets the contemporary age.” We are Tennessee’s premier provider of beautiful, functional commercial cabinets, all made to the highest standards. Our cabinets provide the very best in form and function, no matter the space or style. Call Miller’s Casework today at (931) 739-9292 to see how our cabinets can help make your design and storage solutions come to life! Whether your project calls for straightforward solutions or fully customized, creative cabinetry, Miller’s has the answer. Our extensive product line can help you find the best fit for your vision and needs. Miller’s Casework is committed to excellence in design, fabrication, and installation of commercial cabinetry with a European frameless design. Our company combines the work of experienced, skilled millworkers with cutting-edge software and machinery to bring you commercial cabinetry that meets the highest standards. As a family-owned and operated business, we at Miller’s Casework understand our commercial clients often have special cabinetry requirements. Our process and materials reflect that. Designs focus on streamlined functionality, and installations are planned to be efficient and immaculate, so you can get back to work as soon as possible! Casework for educational facilities – dorm rooms, dining halls, classrooms, etc. 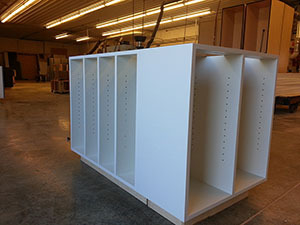 The commercial cabinets we create at Miller’s Casework have to stand up to a lot. That is why we build them to last. 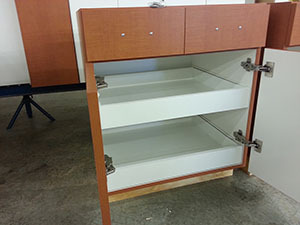 Not only do we make sure our commercial cabinets meet their functional requirements, but we also make sure the hardware, finishes, and other details are durable, yet stylish. When you buy commercial cabinets from Miller’s Casework, you don’t just see the quality; you can feel it, too. Frameless design provides superior access without the inconvenience of center stiles or face frames. High-quality finishes stand up well to normal wear and tear and ensure durable, smooth surfaces. You can choose between high-pressure decorative laminate (HPDL) or melamine. Cabinet boxes are dovetailed for superior strength, aesthetic appeal, and quality. We take great care during installation to make sure your new cabinets are level, centered, and mounted to your exact specifications. Looking For New Commercial Cabinets? Call Us Today! If you are looking for exquisite cabinets that can be customized to meet your exact needs, Miller’s Casework is the Tennessee commercial cabinet company for you. Based out Sparta, we proudly offer quality commercial cabinets to customers in Sparta, Cookeville, Crossville, Knoxville, Morristown, Kingsport, Johnson City, Sevierville, Marvyille, Cleveland (TN), Chattanooga, Columbia, Murfreesboro, Nashville, Jackson, Clarksville, Springfield, Gallatin, Hendersonville, and all of the surrounding communities. We can build your cabinets from start to finish in our local workshop, ensuring close oversight by our skilled millworkers throughout the process. We are confident our cabinets will exceed your expectations. Call us today at (931) 739-9292. This entry was posted on Monday, March 25th, 2019 at 5:05 am	and is filed under Uncategorized. You can follow any responses to this entry through the RSS 2.0 feed. Both comments and pings are currently closed. Custom Gym Locker Building Services Available! Ask About Our Complementary Custom Closet Services! Copyright © 2015 Miller's Casework. All rights reserved. Designed by GPGSolutions.